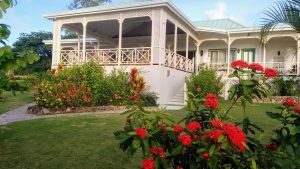 Now is your chance take a tennis vacation or holiday in our private villa on the Caribbean island of Nevis with our own private tennis court. At Hill Rise House, the tennis court is landscaped into the hill side in a corner of the 2 acre property. The hard court is bounded on two sides by high retaining walls (good for practice sessions), and conventional chain link fences on the other sides. Players and spectators can enjoy panoramic views of the Caribbean Sea and Nevis Peak. 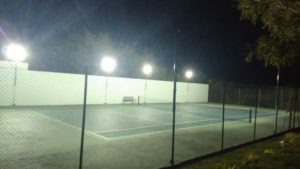 For playing in the cool of the evening, metal halide lamps illuminate the court. In the interests of our neighbours, the lamps are on retractable poles. Serious players are asked to bring their own rackets and balls. The tennis court is just a short walk from the Main House (2 bedrooms) and the Guest Cottage (2 bedrooms). To complete your enjoyment of the property, our 40ft x 20ft swimming pool is located on one of the garden terraces. Always for exclusive occupancy, our rental rates vary according to the number of guests and the time of year.